The home screen is where it all begins. From the home screen you select media files to convert, and you can also open the conversion task list to view a list ongoing tasks and history finished tasks. 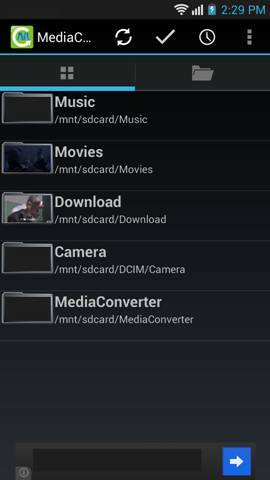 The thumbnail view will scan and all folders containing media files. In settings, you may specify which top folders the app should scan into; and you can also specify what file extensions should be displayed. The file tree view allows you navigate you disk file hierarchy to find your media files to convert. You may select multiple files to add converting tasks in batch by using the multi-select functions. For beginners, you only need to set select the output formats/container from the output format list, and keep all other parameters unchanged, and select “Convert” to start the converting. You may also want to change output destination folder and the output file name, to do these, scroll to the end of the setting page, and edit the “Save to”, and “Rename as”. For converting to audio, please select one of the following container/profile: mp3, m4a (aac audio), 3ga (aac audio), oga (flac audio), wav. For converting to video formats, please select one of the following container/profile: mp4, 3gp, ogg, avi, mpeg, flv. 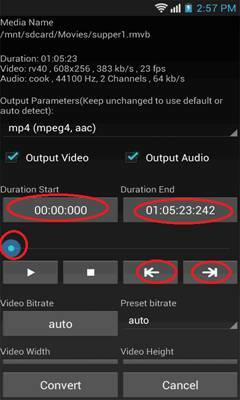 Set the duration start and duration end to get a clip from the original media. Video bitrate is mainly used to control the output video quality, output file size. The default bitrate for video is 200kb/s. In general, higher bitrate, better quality, and bigger file size. What bitrate should I use when converting my video? Unfortunately, there is no standard, the only way to determine the best bitrate for your need is trial-and-error. Note that video quality is subjective, and other encoding options like resolution and frame rate also have an effect on quality. If you are converting video to be played on a lower resolution screen device, you might want to lower the output video resolution to minimize the output file size, since high resolution video will not produce better quality images on low resolution screen device. It is recommended to keep the ratio of the width and height when changing the output resolution. Changing the ratio can lead to a squishing or stretching image effect that is unsightly. To use a preset resolution, please select from the preset resolution list. For 3gp, only certain resolutions are supported. The frame rate is how many unique consecutive images are displayed per second in the video to give the illusion of movement. Around 24 frames per second, the typical film rate which often gives a "cinematic feel," is where most video creators land and is also a point that most human eyes are fooled into perceiving motion. Generally you should never exceed the frame rate of the source video. The best illusion results will be achieved if the frame rate is kept the same as your original source. Lower frame rate might produce a better image quality, but less smooth motion; if motion is smooth enough with a lower frame rate, the video bitrate can be lower to minimize the output file size. Similar to video bitrate, audio bit rate is mainly used to control the output audio quality, output file size. In general, higher bitrate, better quality, and bigger file size. 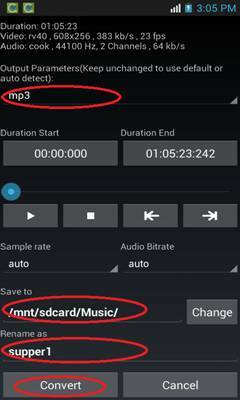 For mp3, the default audio bitrate for mp3 is 128kb/s, which is sufficient for most users. You might consider choosing 256kb/s for close-to-CD quality, without increasing too much of the output file sizes. To have very low audio bitrates, reduce the sampling frequency (e.g. down to 22050 Hz for MPEG audio). Changing the sample rate might result in a distorted output sound, in this case, do not change the sample rate. As soon as the conversion has started you can keep track of the conversion progress here. Conversion tasks are processed in a queue, only one task can be active at a time. Also the history finished tasks are also listed here at the top of the list. To cancel ongoing tasks, or delete the history records, you may click the multi-select icon from action bar, or long press on a task, and then select “delete” function. Note that deleting only cancels the ongoing tasks or deletes the history records; the output files (if any) will not be deleted.